The aroma and taste of this hauntingly delicious vegetable stew comes from the combination of ginger and tomatoes, punctuated by the deep and lingering spice of fresh cumin. Distantly Indian, simple but complex, and definitely more-ish, this is one of those memorable dishes that certain members of my family request whenever they come for a visit. It seems perfect for this time of year when eggplant and tomatoes are on the wane, the air turns crisp and we yearn for warm and comforting food that’s still in the season. This is based on a recipe from Deborah Madison’s brilliant cookbook The Savory Way, although I have adapted it liberally, starting with the way that the eggplant is prepared. She roasts a whole eggplant and cuts up the flesh. I roast unpeeled eggplant cubes. The difference is that in her version, the eggplant becomes a sauce for the potatoes. In mine, the eggplant and potatoes have parity. As a result, I don’t particularly have the urge to serve this over rice, as she does. She remarks that she drastically reduced the amount of oil from the version shown to her from her friend from India. I cut it down even more, relying on the tomato to provide the necessary moisture. 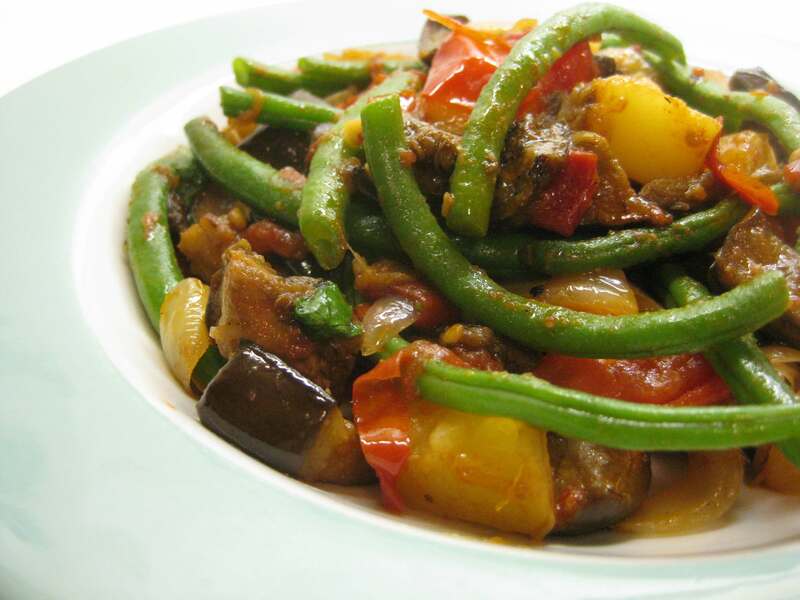 I also added green beans, which provide a contrast of colors, flavors and textures. Prepare the eggplant. Preheat the oven to 400 degrees. Cut the eggplant (unpeeled) into ¾ to 1-inch cubes, salt them lightly and let them drain in a colander for about 20 minutes. Wipe the moisture from the eggplant, toss the cubes with about half of the olive oil and place them on a baking sheet. Cut the potatoes into 1/2 -inch pieces, toss them with a sprinkling of olive oil and salt and add them to the baking sheet with the eggplant. Roast the vegetables, turning once or twice, until golden brown and soft. Toss the whole cumin seeds in a saute pan to toast slightly. Grind half to powder and reserve the other half. While the eggplant and potato are cooking, heat the remaining oil in a sauté pan over medium heat. Add the onion and sauté until lightly browned. Add the ginger, the ground cumin, bay leaf and garlic and stir to combine and cook slightly. Add the tomatoes and cook gently until they start to break down into a sauce. Add the eggplant, potatoes and a little water if the tomatoes are not very juicy. Cook over medium to low heat for about 10 minutes until the whole stew is cooked. Taste and adjust for salt. Just before serving, add the cilantro, whole toasted cumin seeds and (optional) green beans. Serve swirled with yogurt. Accompany the stew with rice (if you want).